A couple weeks ago, a large dark spot appeared on the sidewalk in front of our house. I eventually figured out that it was caused by a large maple tree dripping sap. 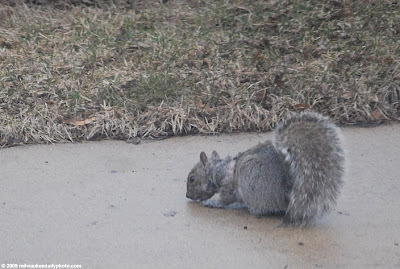 Ever since, our favorite neighborhood rodent has been paying regular visits to lap up whatever drippings he could get to. I would think that it would be much easier to just climb the tree and take a drink straight from the branch, but then again, I'm not a squirrel. Squirrels are curious inventive critters, and so cute.